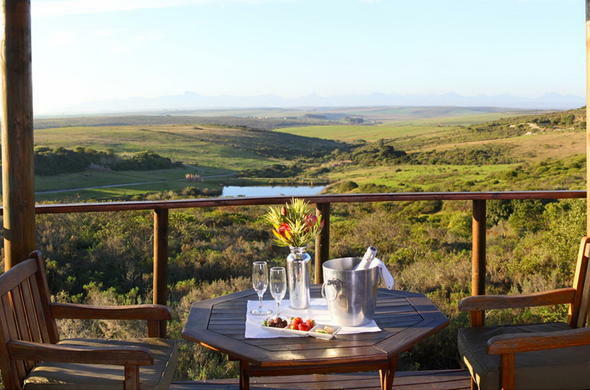 This Western Cape lodge offers luxury accommodation in a malaria-free private game reserve on the Garden Route. Enjoy Big Five safaris, weddings or conferencing. The Garden Route Game Lodge is set against the backdrop of the majestic Langeberg Mountain range on the breathtaking Garden Route Coast. The lodge is situated on a malaria-free private game reserve that is home to an abundance of African wildlife. Enjoy Big Five safaris and be lucky to spot Elephant, Rhino, Buffalo, Lion and Leopard. This Western Cape lodge is only 3-and-a-half hours' drive from Cape Town. Garden Route Game Lodge offers guests luxury accommodation in units with a beautiful African theme. Things to do at Garden Route Game Lodge include game drives and visiting the Reptile Centre and Cheetah Breeding Centre. This Western Cape lodge has a fully equipped conference centre and the beautiful setting makes Garden Route Game Lodge ideal for romantic weddings. Guests can enjoy delicious cuisine at the Serengetis Restaurant and choose from a selection of fine South African wines with assistance from the attentive waiters. Children of all ages are accepted and a babysitting service is available.